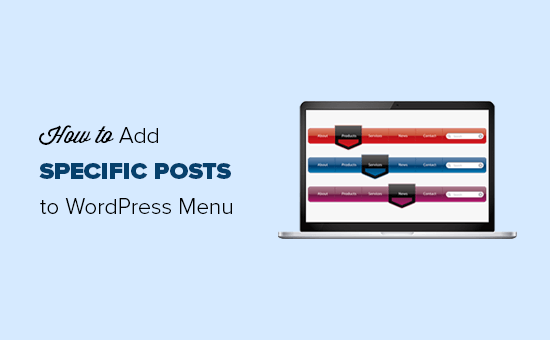 Do you want to add specific posts to your WordPress navigation menu? Menus in WordPress can be fully customized, and you can add custom links, pages, posts, categories and more. In this article, we will show you how to easily add specific posts to WordPress navigation menu. When and Why Add Specific Posts to Navigation Menu? Navigation menus allow you to create a navigational structure for your website. This helps users quickly find the most important sections of your website. 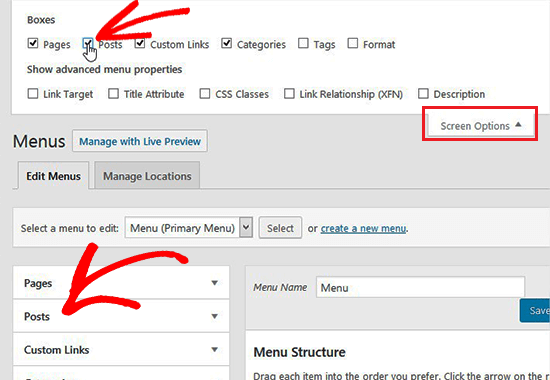 WordPress makes it very easy to create and add navigation menus on your website. By default, it shows sections to easily add pages, categories, custom links, and more. Normally website owners add pages to their navigation menus like about page, a separate blog page, pricing page, or a contact form page. Some websites add categories to navigation menus which allows users to quickly jump to different topics on their site. However, sometimes you may need to add an individual post to your navigation menu. This could be your most popular post or something that you would like your users to find quickly. 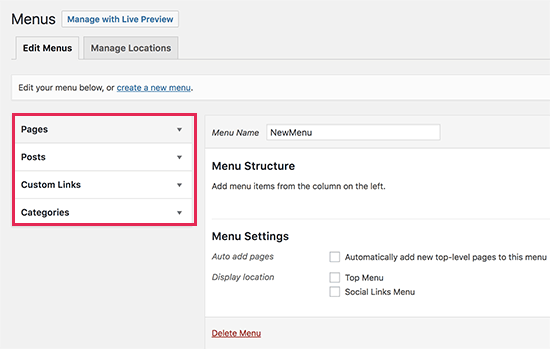 That being said, let’s take a look at how to easily add specific posts to WordPress navigation menu. 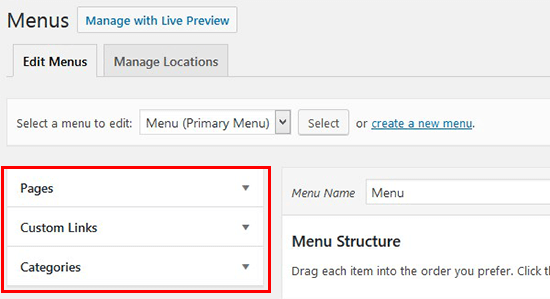 First thing you need to do is go to Appearance » Menus page in your WordPress admin area and select a menu to edit. You can also create a new menu and use it as your navigation menu. After selecting the menu, you’ll see tabs for pages, posts, custom links, and categories. You can click on each tab to expand it. If you cannot see the Posts tab there, then you need to add it by clicking on the Screen Options button at the top right corner of the screen. Once the Post box appears, you need to expand it to select the specific posts that you want to add to your navigation menu and click on the Add to Menu button. 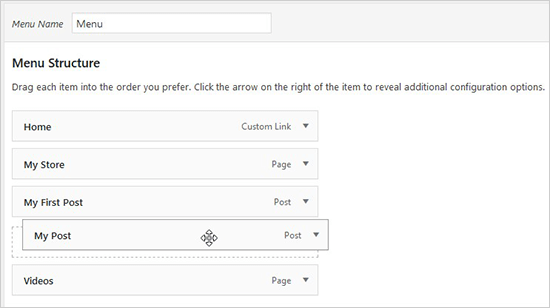 After adding the specific posts to the navigation menu, you can drag and drop menu items to adjust their display order. You can also customize the label to change the post title into a smaller title. Make sure to save it and visit your website to see your WordPress navigation menu with specific posts in action. Navigation menus can be further customized to add search bar, social media icons, log in / log out links for your blog, post type archive, and more. You can also style your navigation menus to change their colors and appearance. 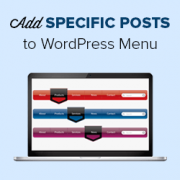 We hope this article helped you learn how to add specific posts to WordPress navigation menu. 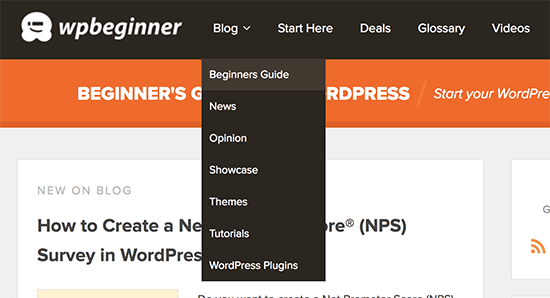 You may also want to see our expert pick of the best tutorials to master WordPress navigation menus to easily customize and manage your blog navigation. How do I publish posts under these pages? 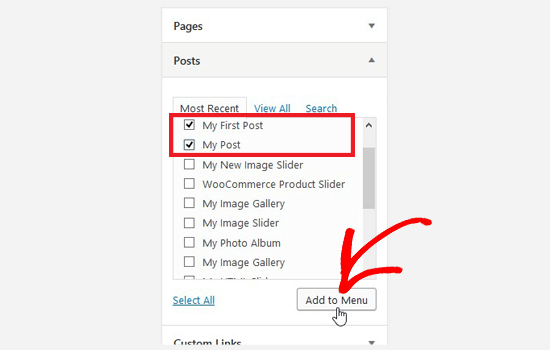 Or instead, add the category of the posts to the menu rather than a specific page for WordPress to automatically create the page listing the posts in that category. This is helpful info! I’m trying to figure out how to create my drop down menu with pages that will be like my home page with thumbnails linked to the posts within that category only. For example, the category on my navigation bar is FOOD. Then a sub category is a RECIPES page that shows thumbnails to my most recent recipe posts. I hope that makes sense. Do you know how to do this? Thanks! If you add the category itself to the menu then WordPress should automatically generate the page listing your posts in that category. Is it possible to dynamically show the last N posts in a menu? It is possible, we just do not have a simple recommended method at the moment.